Yes, and you could switch the channels and each had its steady tone that was a different pitch (note), some higher, some lower. I think those tones are called "sine waves." 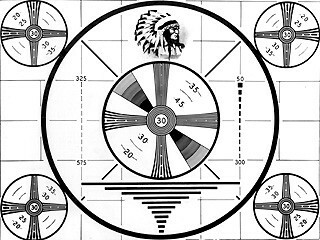 Wasn't there a high-pitched sound that came with those TV Test Pattern images ? Kind of reminds me of "The Outer Limits"........."We are in control, do not touch the dials"....... LOL !! A while back, Alan asked, "Why an Indian?" I think that the Indian simply served as a standard image (with details and shading) that a trained television engineer could glance at to see if any adjustments were needed. What amuses me is that the same test pattern was used around the world in such places as Sweden and Rhodesia. For further info on this image, see Indian Head test card in Wikipedia. Yes! And they'd wake the station up at 5 AM with the National Anthem too. I liked the version that started out with a long drum roll. One of our local stations used to play the Star-Spangled Banner at sign-off. My father was a boozer. He once mistook the TV being off after midnight as something broken with the TV. He took the no good for nothing TV out in the back yard and threw a brick in to the screen. Then I couldn't watch KBHK 44 and Popeye, Kimba and Speed Racer. I was the chief engineer at a radio station, and our station signed off about 12:10 after the 12:00 CBS news, and signed on at 5:30. That was my time to work on the station. I don't know how any transmitter work gets done on these 24 hour stations. Remember when the local TV stations would sign off for the night, often at 1:00 or 2:00 in the morning? Perhaps some still do, I don't know. I used to love the film that San Francisco's KRON-TV (4), an NBC affiliate at the time, ran in the 1970s just before signing off. It showed various peaceful scenes of California and the Bay Area, accompanied beautifully by "Pavane" by Gabriel Fauré. You can get a sense of the beauty of this combination here if you concentrate on just the scenes of nature. Thats one I really miss.